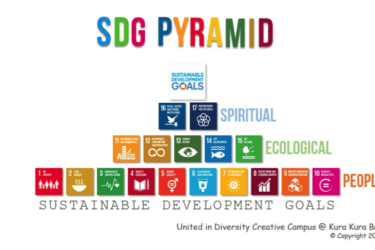 The SDGs are a set of 17 goals laid out by the UN member states. They have been developed using targets and indicators to inform political agendas, policies, and commercial decision making and are aligned along the general themes of reduced poverty and inequality, innovation and sustainability, and better managing our natural resources. Clearly, the goals are aligned and complementary, however, the interdependency of the goals presents a challenge as well as an opportunity. I attended the GEC as a Happold Foundation Ambassador, following the Clean Water and Sanitation ‘stream’ (SDG 6). Throughout the week, it became clear to me that although independently there is a logical road map to achieve the individual SDGs, if nations and industries target each one in a silo, we are not going to meet the goals. 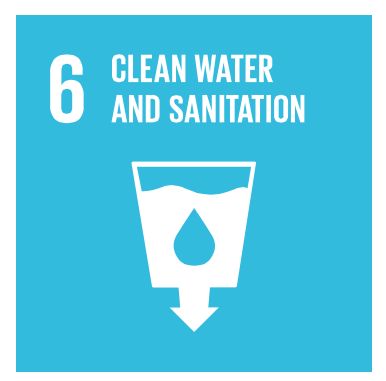 For instance, take SDG 6. This is a global issue that cuts across several themes, challenges, and SDGs, for example: Energy, Poverty, Gender Equality, Zero Hunger and Decent Health Work and Economic Growth, to name a few. Narrow decision making on clean water and sanitation provisions may lead to intensive water treatment facilities, with high energy demands, leading to a compromise on clean and affordable energy. Similarly, you can’t tackle hunger and poverty without addressing the scarce availability of water. This network of SDGs, goals and indicators is so complex that conflicts can arise even within an individual stream. For example, privatisation of a water supply may bring a more reliable water source to a larger network, but at a higher cost to the poor, increasing inequalities and creating social problems. This is something that Peter Grevatttouched upon during the session on Balancing Availability and Affordability of Water. So how do we face this challenge, and ensure that we take a comprehensive, interdisciplinary approach to meeting the SDGs? 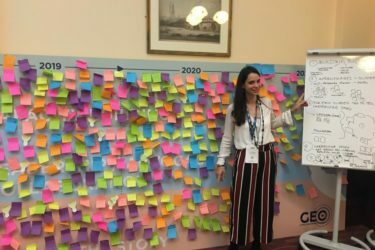 The games company, Free Ice Cream, have illustrated this matter and developed the game, ‘2030 Hive Mind’, launched in 2017 at the Global Festival of Ideas. This game allows players to perform as key actors striving to meet the SDGs. Through different imposed parameters and limitations, the players learn the consequential negative impact that tunnel vision decision making can have on overall SDG progress. Understanding the interlinked nature of these decisions encourages players to think across the goals, and to collaborate, trade and cooperate to achieve the SDGs in a dynamic and changing environment. This mind-set of collaboration is key to achieving the SDGs. As engineers, we are increasingly aware the benefits to a multi-disciplinary approach to projects and problem solving. Collaboration for the SDGs is essential both on an international and industrial level. The GEC did an excellent job in bringing together delegates from all nations to focus on the goals, in the context of engineering; but in order to achieve the goals, we need to establish a multi-sector coalition, and engage across a broad range of networks, out with the built environment, to align both goals and impacts. There are initiatives championing this holistic approach to development and service provision, incorporating a range of sectors and impacts. For example, the Toilet Boardhas identified that sanitation can be tackled as a cyclical service; generating investment, producing energy, and engaging innovation, local industry and health care, through monitoring and sharing data. They call this the Sanitation Economy, and it was presented by Sandy Rodgerat the GEC. 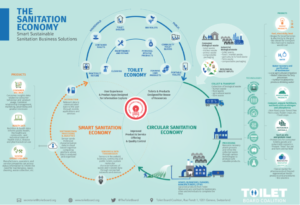 The infographic below gives a good indication of the Sanitation Economy, how it works, and all the different elements it considers and interacts with. Peter Grevatt is the Director of the Office of Ground Water and Drinking Water, US Environmental Protection Agency. He addressed the topic: ‘Assessing water tariffs, cost-recovery principles and investment needs and requirements’.